The statement startled the student guide, not because it was said louder than necessary because of the speaker’s difficulty in hearing, but because the last thing a guide expects on his tour in 1997 is someone who can tell the story first hand. 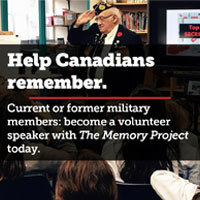 The speaker was 104-year-old Harry Boyce, a member of the Legion’s Regina Branch. He was a sergeant with the Canadian Garrison Artillery that day in 1917 and would later fight at Passchendaele and elsewhere. In June 1918, Boyce was gassed and sent to hospital in England. He was one of six WW I veterans on the April 6-13 pilgrimage organized by Veterans Affairs Canada and led by Governor General Roméo LeBlanc to mark the 80th anniversary of the capture of Vimy Ridge. The other WW I veterans on the pilgrimage were Gordon Boyd, 98, of Fredericton, who was wounded in France while serving in the 12th Siege Battery in 1918, Fred Evans, 99, of Saint John, N.B., who participated in the capture of Hill 70 and Passchendaele, Harold Lidstone, 101, of Brae, P.E.I., who served in various engineering units throughout the war, Cyril Martin, 97, of Edmonton who was wounded in WW I and served as an army chaplain in Italy in WW II and Tom Spear, 100, of Calgary, a self-taught telegrapher who served with the Canadian Signal Company. Of these men, only Boyce had actually participated in the fighting at Vimy. The memories of these six men provided the personal touch as the rest of the delegation grappled with history and their imaginations to understand the grisly 1914-18 war. For us it was a challenge to bring remembrance to events we have no memory of and to wonder whether WW I will continue to symbolize the worst that nations can unleash at each other. Certainly one cannot fail to be impressed by the memorial unveiled at Vimy by King Edward VIII on July 26, 1936, after 11 years of construction. Its twin pylons dominate the countryside, eight kilometres outside of the city of Arras. The mournful figure of a mother–weeping for her fallen children–stands front and centre, and the walls of the memorial are inscribed with the names of 11,285 Canadians who were listed as missing, presumed dead, in France during WW I. While the memorial sits on 250 acres of tranquil parkland, the site must have been very different on Easter Monday, April 9, 1917, when Canadian soldiers under Lieutenant-General Sir Julian Byng began their attack on the German stronghold. It was the first time that all four divisions of the Canadian Corps fought together. For two years the Allies using traditional European military tactics had been unable to take the ridge rising 61 metres over the Douai Plain. But the Canadians thought they could do it differently. The plan had been carefully practised on a full-scale replica of the ridge built behind Allied lines. The attack was supported by supplies sneaked closer to the battle front through tunnels and on light railway lines. The Germans had been battered with a barrage of artillery for weeks, but that day the barrage began to move closer to the line. Behind the barrage advanced the first wave of attackers–approximately 20,000 Canadian soldiers. Fierce hand-to-hand fighting followed as the soldiers reached the lines. Machine-gun fire rained down on the troops especially from another ridge known to the Allies as the Pimple. Three of the four divisions captured their objectives by midday and all objectives would be reached by the next day. The Pimple would fall two days later to the 10th Canadian Brigade. By then, Canadians had reclaimed three kilometres of occupied France, but the cost on the muddy slopes was high: 10,602 Canadian casualties of which 3,598 were fatal. Joining the WW I veterans last April were 32 WW II veterans, representing the WW I army units that fought in the battle and exist today as militia units. Also participating were representatives of Canada’s major veterans associations, including Joe Kobolak, dominion president of The Royal Canadian Legion, and WW II Victoria Cross recipient Smokey Smith. Another generation of politicians, delegation officials and media were also along, as were 12 youths representing each of the provinces and territories. The 16- to 18-year-olds had all participated in The Royal Canadian Legion’s Encounters With Canada program at the Terry Fox Canadian Youth Centre in Ottawa (Valuable Encounters, May/June). The youths were there to represent the youth of Canada in formal ceremonies and to participate in the making of a film similar to the one used in the Canada Remembers educational kit that is sold to schools throughout Canada (Canada Remembers Carries On, May/June). “We hope eventually to do for WW I what we have done for WW II,” said Len Dent of Veterans Affairs Canada. The following day the group joined the Canadian Forces contingent for formal ceremonies at the memorial. A 100-man honor guard chosen from Canada’s three regular force regiments, the Royal Canadian Regiment, the Royal 22nd Regt. and the Princess Patricia’s Cdn. Light Infantry marched onto the field. Appropriately, they were accompanied by the Royal Cdn. Artillery Band since the artillery had been so important in the success of Vimy Ridge. The Quebec City-based band, one of Canada’s four remaining regular force bands, had entertained the Governor General and the delegation the evening before in an old concert hall in Arras. The French matched the Canadian contingent with its own band and honor guard. France’s minister responsible for veterans and victims of war, Pierre Pasquini, joined LeBlanc as the only speakers before the Act of Remembrance. Following the ceremonies, the Governor General hosted a reception in a tent erected behind the Vimy Memorial. During the social function, LeBlanc announced that Canadian Heritage Minister Sheila Copps had declared the battlefields and memorials at Vimy Ridge and Beaumont Hamel national historic sites. They are the first such sites to be declared outside of Canada. The French government acknowledged the undeniable significance of the participation of Canada and Newfoundland in WW I by giving the land to Canada for all time. The sites will continue to be managed by VAC, but Parks Canada will offer technical and professional advice to conserve and improve the battlefields and monuments. LeBlanc left for Paris for planned meetings, and Lawrence MacAulay, then secretary of state for veterans, was called back to Ottawa shortly before the federal election was announced. MP Len Hopkins from Petawawa, Ont., led the delegation through the final, lower-key ceremonies in Belgium. The first was under the Brooding Soldier monument at St. Julien. The 11-metre shaft of granite is topped with the bowed head and shoulders of a Canadian soldier with his hands folded, resting on arms reverse. It was here in 1915 that Canadians withstood a terrible gas attack from the Germans holding their posts until reinforcements came. The Canadians suffered 6,035 casualties in two days of fighting. Following the ceremony, the delegation visited Tyne Cot Cemetery, the largest Commonwealth war graves cemetery in the world. Here 1,011 Canadians are buried with nearly 12,000 British dead. Among them is a great uncle of Karen MacDonald, the Prince Edward Island youth representative. It was here where Cyril Martin, a veteran of the Passchendaele fight, found himself crying. “I was overwhelmed,” he said later. “There were so many of my comrades, my friends.” Martin was wounded during the battle and sent to recover in England where his real age was discovered. He was told he could not go back into battle until he was 19. By that time the war was over. The final ceremony that was held during the delegation’s trip to France and Belgium was quite simple, but perhaps the most touching. In the city of Ypres–every night at 8 o’clock–at least two firefighters arrive on bicycles at the Menin Gate, a 17th-century gate to the city that was destroyed in WW I and then rebuilt as a memorial to Commonwealth soldiers with no known grave. The names of nearly 55,000 Commonwealth soldiers killed in Belgium are carved over the massive gate. Traffic is stopped and Last Post is played. When the ceremony is over, the buglers get back on their bicycles and leave. On the night the VAC delegation arrived, Guy Gruwez, chairman of the Last Post Committee, made a short speech welcoming the Canadians. Following that, the Last Post was played by six buglers with a Canadian Forces trumpeter standing in the middle of them. The crowd burst into applause as Canadian WW I veteran Tom Spear walked up the steps of the monument and then placed a wreath on behalf of WW I veterans. While Spear and the other WW I veterans actually remember the war, the rest of us remember the images of the pilgrimage. Technology was playing a part in conveying the message as Canadian and European media covered the events in print, radio and television. The Canada Remembers film crew shot hours of footage that will work its way into video and eventually a CD-Rom for school computers. While we take our memories and our photos back to Canada we leave behind the silent witnesses–the defiant Caribou at the Beaumont Hamel monument, the mournful mother at Vimy Ridge, and the land, though green with grass and supporting tall trees, still pock-marked with the unnatural shapes of manmade trenches and the craters of artillery fire. And we leave all the rows of white tombstones in the war cemeteries scattered around small villages that will remain into the next century.